It’s important to address your HVAC filters regularly! How often should I change my HVAC filters – and are washable filters better than regular ones? In general, what types of filters are available for HVAC systems? And what’s the difference between them? Generally, air filters fall into one of three main categories: media-type filters (including fiberglass and pleated filters), electrostatic-type filters, and electronic-type filters. Though there are many differences between the three types, the main difference for all practical purposes is their capture rate, which relates to how finely they filter out particles in the air. Filters with a low capture rate will filter out only larger particles in the air, while filters with a high capture rate will filter out both large and small particles in the air. Of the three types mentioned, media-type filters have the lowest capture rate. The electronic-type filters are the most effective because they set up a charge that attracts and filters out very small particles within the air. Electrostatic-type filters fall somewhere in the middle. Filter selection should be based on the needs of the homeowner. Routine media-type filters serve many homeowners just fine. Other homeowners might have a history of allergies and, thus, turn to specialty filters to address those unique needs. Should I change my HVAC filter on my own? If so, how often? Yes, many homeowners change their HVAC filters on their own. But keep in mind that this may not be possible on all systems. 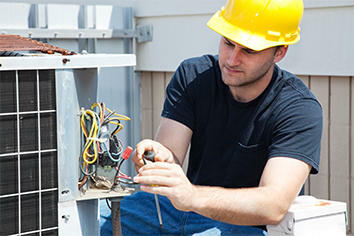 Frequency depends upon the system installed and the needs of the homeowner. Many homeowners change their filters quarterly, while others change their filters twice per year. Will my service technician change my HVAC filters when he comes for a preventive maintenance visit? Yes, this will happen in most cases, provided that filters are provided by the homeowner (or the homeowner purchases filters through the service company for use during the service visit). Keep in mind, however, that you may have to change your filters more frequently than you have a service visit. Twice-per-year service visits are recommended (for example, in the spring and fall), but you may also need to change your filter at other times throughout the year (for example, in the summer and winter). What about washable filters for my HVAC system – can I buy those? Or are those only meant for certain, special systems? For the most part, you should be able to find a washable filter for your HVAC system (although this may not always be possible). Be sure to let us know if you have questions about filter/system compatibility at your home or office – we’re happy to help you sort things out! Are washable filters any better than non-washable filters? Not necessarily. In some cases, washable filters may save you money in the long-run (since you’re purchasing fewer replacement filters). But it’s important to keep in mind that filters are only as good as the maintenance given them (whether that means washing them routinely or replacing them routinely). Proper maintenance is key. Generally, you should change your filters either twice per year or on a quarterly basis, based upon your HVAC system requirements and your preferences. While washable filters may save you money in the long run on replacements, they are not necessarily “better” than their standard counterparts. In both cases, proper maintenance is key to success.